One of the bonus options for the February Kickstarter will be woodcut print cards. The cards will be from an in-story game called Dok. Dok is the Allfield word for the struggle of good and evil as well as the name of the little card game. It was fun making cards for a game that only exists in a fictional world. I grabbed some planks of wood and measured some long and narrow card areas. Using a pencil, I filled in a design which I then went over with black ink. That way, I could see it clearly while I hacked away with it with whatever carving tools I could find in the garage studio. I made a few rounds of thick handmade paper to print on. Unfortunately, they turned out looking like bacon. My paper was so lumpy I decided to go with regular watercolor paper and let the designs and prints be rustic looking. My first few sheets came out too ghosty and there was interesting texture. But the ink was not layed on right and too many areas didn’t show up. So I remixed inks for the next round with a better, even consistency. Black also came out as my favorite color ink to use. Test printing woodblock prints (too light) on sheets of watercolor paper using different mixtures of ink and paint. In my excitement I forgot to stain and age the cards after I cut them. I could have done it before I polished them with candle wax, but I forgot then too. Browning the paper a bit would have been great for the test, but at least I was pretty happy with the waxing stage. The cards felt smooth and interesting to hold, and no longer seemed just like paper. After cutting sample prints, card corners are rounded and cards are hand polished with wax. Next round, darker ink and applying an aging stain before the wax polish. As I get closer to finishing round two of the printing process, I will post official pictures of the final products. I can’t wait to show them. One of the greatest things about this project is when it triggers another’s imagination. One young fan liked Allfield so much he started making his own characters and animals and monsters. These drawings are outstanding, and I wanted to share them online. While going over these drawings it only seemed natural that I tried to adapt some of these characters to the comic’s drawing style and even include these into an official deck as a sign of appreciation and gratitude. 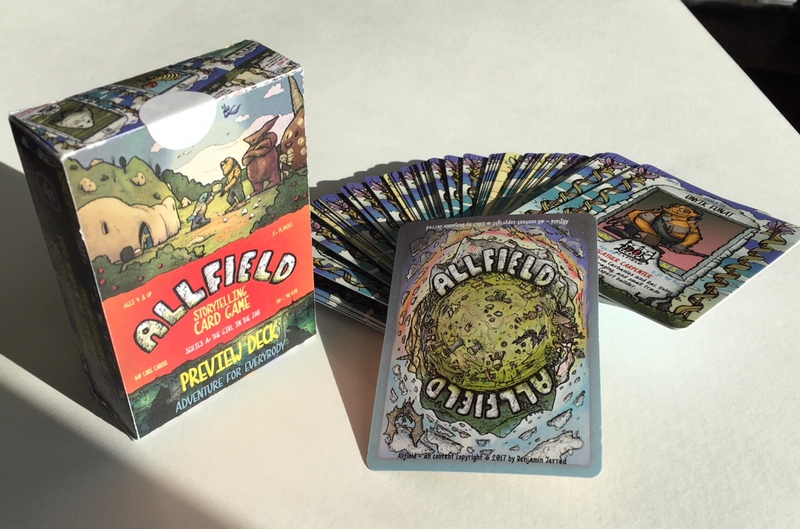 Adapting fan design into Allfield card design. As I get ready for a new school year, it is an incredible privilege to stop and enjoy and share moments like these with children’s imaginative artwork. Over the years I’ve taught students from pre-k up through college. I have been fortunate to work with and watch thousands of people interact in a classroom from age 3 to 88 years old. I found they all share a common need-they needed to be heard and listened to. Students need practice talking, listening, taking turns, and working together in a structured format. This is especially important for younger students and frustrated students. Therefore I wanted to make a game that addressed these ideas, and have it be all-age friendly. I created a tabletop-card game – a super simple storytelling rpg, which mimics how kids play pretend, but has enough structure to balance all players’ voices. I hope you get a chance to enjoy the game, and maybe even emulate this young artist and create your own. Feel free to send me any of your thoughts or drawings.